Several few years ago, satellite-based navigation systems were available only as expensive, built-in options on new vehicles. Nowadays, portable GPS devices that can be hooked up and fully operable in minutes have become accessible and affordable to every driver, not just those with cash to spare. I was amazed at how quickly the portable GPS technology has progressed. I have a factory installed GPS in my Infiniti that I rely on more everyday to tell me where to go. I used to have problems finding places. I would get lost all the time and it ended up being a real issue. Getting directions from people is time-consuming and MapQuest isn’t always 100% accurate, so having a reliable GPS has undoubtedly saved me tons of time and gas money. There are a few things to seriously consider prior to purchasing a portable GPS. Hopefully we can assist you in locating the portable GPS that’s ideal for your particular needs and specifications. For most folks, price is the first thing to consider. Portable GPS navigation devices (PND) range from as little as $129 to more than $2,000. Fortunately, there are a lot good portables available for less than $500. The second question is what you want your GPS to do. If you want all the bells and whistles, you’re obviously going to pay more. The more pricey models feature things like Bluetooth handsfee technology, live updates, turn-by-turn directions, and more. But, if all you want from your GPS is for it to get where you’re going, accuracy and ease-of-use are obviously the top priorities. Most of the lower-priced models feature smaller screens, and require that users load their choice of maps onto a memory card that is then inserted into the unit. The higher-priced alternatives have bigger screens with better graphics and don’t require memory cards. In the $299-and-up category, most GPSs are pre-loaded with maps. Screen sizes range from 2.1 inches to 7 inches. I found the 2.1-inch screen to be just too small. If you have to lean over and squint to read it, you’re risking getting into a wreck or getting lost because you can’t see the thing without binoculars. On the other hand, the 7-inch screen (featured on some of the Garmin models) is too large, in my opinion. Hey, I just want to reach my destination. I have a big screen in my living room, thanks very much. 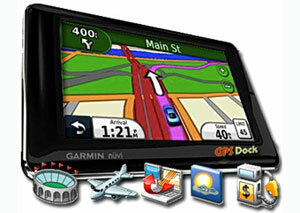 A GPS with a high-quality user interface should have menu systems that are easy to understand. Those systems that require the skills and knowledge of a computer programmer didn’t make my list. I’m not a tech whiz, so if it’s hard to operate, I won’t use it. Which means I’m back to asking the locals for directions. If you’re searching for hotels, gas stations, and restaurants, you shouldn’t have to jump through a bunch of hoops. A good system should make this information available with no more than two steps using the navigation screen. The fewer the screen taps the better. Several of the top-tier systems complement the touch-screen user interface with dedicated hardware buttons that let you jump to frequently used functions with ease. Portability is another important issue to consider. Some units operate directly from a car’s battery, while a handful have built-in rechargeable batteries that will power the unit from 4 to 15 hours. Almost all portable GPS devices are accompanied by a suction-cup mounting bracket that will adhere conveniently to your windshield. With a high-quality bracket, taking the GPS in and out of its holder should be a snap. Text-to-speech is a technology that enables a GPS to pronounce any street name. Most GPSs will announce an upcoming turn with a phrase like, “In .5 miles, turn left.” Those with text-to-speech capability can announce a turn like this: “In 300 feet turn right on Main Street.” Since the name of the street is announced, you don’t have to take your eyes off the road to glance at the screen. If your GPS can’t recognize voice commands properly, it can be a real pain. The other day I was trying to get to Eddy Street in San Francisco. The built-in GPS in my car couldn’t understand the word “Eddy”. It gave me “Annie”, “Ernie” and “Army” and I finally had to pull the vehicle over and type the street name into the system manually, which was a real headache. So, test any portable GPS system before you buy it. Try a few less common street names and see how it responds. It is great that phones now have navigation, but they will not kill-off personal navigation devices. While smartphones are increasing in popularity among the tech-savvy crowd, don’t expect PNDs to become as irrelevant as an 8-track player. PNDs have a number of advantages that no iPhone app can overcome. Another factor to consider is how to obtain updates once you’ve purchased your unit. Street and highway names change; new ones crop up; and the database of destinations is shrinking and expanding all the time, as new businesses open and old ones close their doors. With some systems, the updates are free and can be loaded into your unit very easily online. Others, like some of the Magellan units, will require you to purchase software updates, which means you have to pay approximately $50-$70, and then ship them your unit so that they can install the software. The PND now feature access to live traffic data that is fed directly into your navigation system to tell you about things such as construction delays and accidents. TomTom Live and Garmin nuLink services are examples of how navigation systems can benefit from live data updates. Even though GPS-enabled smartphones are becoming more popular, portable navigation device does offer advantages over their smartphone counterparts. PNDs have larger screens which are easier to read and can display more information. Wireless technology provides real-time information such as traffic updates, weather, and gas prices. Maps are also built into the machines and won’t suddenly disappear when the wireless network goes hazy. When asked to review the best portable GPS systems on the market today, I decided to go to several retail stores and sift through the contenders and the pretenders. I also looked to see which ones were getting the most favorable reviews online. Not true. A portable GPS system will last a lot more than 2 years and continue to be useful if it has the ability to download software updates to keep the maps and info current. Several of my friends have Garmin Nuvis, been using them for several years, and not one has stopped working. I have heard that there is a Navi that allows you to change its “voice” /accent.Me thinks that it would be cool too. I am shopping for a navi under 200 any suggestions? ולגביי GPS -520 של PREMIER יש המלצות קניתי אתמול ? I asked for ACCURACY recommendation as my 205 is FREQUENTLY wrong. Looking for some feedback from the readers. Is the information provided on page 1 helpful or do you jump directly to page 2 to view the best GPS devices that were chosen? 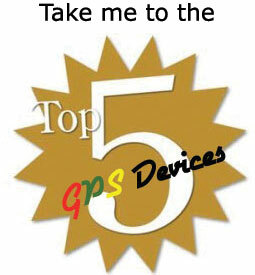 Top 5 portable GPS list for cars updated just in time for the holiday shopping season. New on the list is an entry from Motorola – MOTONAV TN765t. Garmin is still a popular choice amongst consumers and technical evaluators, but TomTom and Magellan aren’t too shabby either. Hey Stan44. You’re calling people idiots and you can’t even spell. Classic. stan44 – You should have the electricity and telephone turned off in your trailer home…and why are you using the world wide webs? I reccomend you also sell your pick up truck and get the kids used to running from town-to-town. You frakking idiot! You probaly have no problem parking them in front of the TV or the Wii, huh? GPS navigation happens to be the greatest technological advance of our generation. It’s even better than the singing bass hanging on your living room wall. Now that Garmin has released their Garminfone on T-Mobile service, an update of our article, “Portable Network Devices Rule Over Smartphones w/GPS”, is due. I agree, a person should learn how to read a real map before becoming dependent upon GPS devices. Just like a person should learn how to do long arithmetic before relying upon a calculator. It may be slow and archaic, but we shouldn’t be relying upon technology too much. I have a road map in the glove box. I paid $2.50 for it. The kid has fun tracking our routes. illiterate, like many that are becoming electronic dependent. We know 12 year old kids that cannot read a compass. Chances are your kid is an idiot too. listen to anything you tell them. It really very important to get a good GPS system for vehicles….they tend to be of great use at times.Hence many thanks for sharing your information with us. You know what I use, and have been using, and pretty much am very happy w/. My cellphone and maps.google. Why pay money for a service that is already out there? Though I wish the GPS was a bit stronger. Sometimes it takes a couple time to locate me if there isn’t a direct view to the heavens. 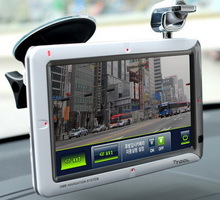 i have got one unit was similar to TomTom GO 930, but the price was much cheaper than GO930. I have heard some very good things about the Navignon 8100T. It has great graphics, free real-time traffic updates for life, 12 map updates available for three years for just $79.99, and a great Zagat Guide built-in, providing recommendations for restaurants, hotels, etc. The only things that caused me to not include it in my Top 5 is the price ($599.00–at this price point, why not go with the Nuvi?) and the fact that they’ve had some problems with the voice recognition feature. If a GPS nav system is not top-notch when it comes to voice recognition, it’s useless to me, because if I have to pull over, the entire purpose of the unit is now moot. I’m curious if you considered the new Navigon 8100T, and how you think it compares with Nuvis. Please be aware that California has laws pertaining to objects attached to the windshield that affect the driver’s field of vision. The top photograph depicts an illegal position for a portable nav-system. Below are the only areas where an object can be attached to the front windshield in California. “a 7-inch square area in the lower corner of the windshield farthest removed from the driver (the passenger side) or in a 5-inch square area in the lower corner of the windshield nearest to the driver (the lower left corner of the windshield). Post up if your state has similar laws.